Another popular gathering place for workers and casual visitors, this plaza provides shade trees, green space, and detailed landscaping within a bustling urban environment. 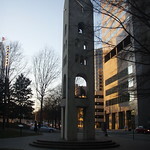 This plaza features a 45 foot tall limestone clock tower that chimes a 25 brass bell carillon on the hour and half-hour. 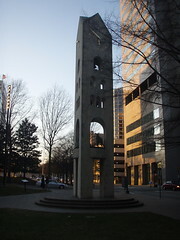 The stone amphitheater in the plaza was constructed using stones from the historic Kanawha Canal.